Caesar salads were the first salad I ate when I was little. (I think it was only to steal my mom’s croutons.) I still really like Caesars now, but they’re usually saturated in a rich, fatty dressing. I found this recipe for a healthier and homemade take on Caesar dressing from The Forest Feast using Greek yogurt and a few other ingredients. Inspired by living in Ithaca and its Moosewood-roots, I decided to try this modern twist on a classic Caesar with Greek Yogurt Caesar Dressing. The outcome was delicious. Ingredients (makes about 2/3 c with 1-2 T servings). Combine all dressing ingredients in a blender or mini food processor and blend until smooth. 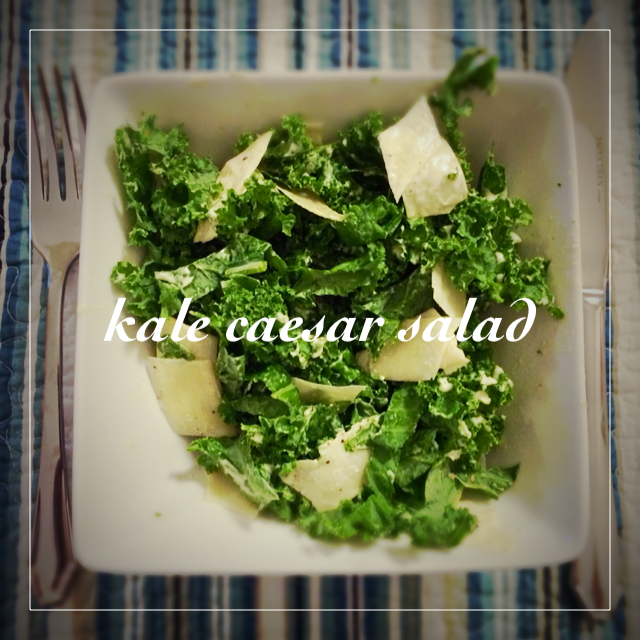 Toss with your favorite salad. Nutrition for 1 T of dressing. Pingback: Summmertime Flatbread: Kale, Asparagus & Cherry Tomatoes | Eat. Drink. Savor. Repeat. Pingback: Ich liebe, dass . . . I’m Nominated for the Liebster Award! | Eat. Drink. Savor. Repeat.